I don’t know much about the movie star Elizabeth Taylor, but from a short bio I recently saw on Turner Classic Movies I gather that she was not an uncomplicated person; besides being beautiful and talented, she had a great sense of humor and a deep capacity for friendship. The Elizabeth Taylor that is my subject here (British author: born 1912, died 1975) was not uncomplicated either. All you have to do to know that is to read some of her stories. 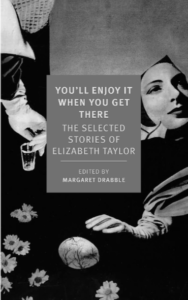 The stories in the collection selected and edited by Margaret Drabble (Taylor published five volumes of short stories in all.) are lively, compelling, and thoroughly satisfying reading, perfect for any situation—bedside table, airplane, doctor’s office, beach vacation—you name the venue, they’ll do the trick. Why? Well, I’ve only read one of Taylor’s novels (her last—she wrote eleven), but her mastery of the short story form seems miraculous. Within seconds she immerses you, effortlessly, in her fictional world. As if by magic, the atmosphere, tone, social landscape, cultural assumptions, and moral code are in place. You know exactly where you are. But what things mean is a different matter. Almost all her stories are about the not-very-exciting doings of middle and upper middle class English people in the decades just after World War II. But within her circumscribed settings, Taylor’s scope seems limitless. From the old woman in the almshouse being visited by her betters in “The Benefactress” (a story that examines with great subtlety what exactly charity consists of), to the wife savagely judging the other hotel guests in “In the Sun” (one of a handful of eye-opening vignettes of the British on their European vacations), to the London Sunday of a young black man from the West Indies in “Tall Boy,” the stories cover a range of human situations, probing beneath the surface of each to examine the distances between what people feel, how they behave, and what they say. You never know what’s going to happen in any of them until the final paragraph because—and this is key to understanding the kind of writer Taylor is—the author’s take on the human condition is not settled. If you’d read only “The Devastation Boys,” about a woman who takes in two inner city boys for a couple of weeks’ vacation, you’d think Taylor was a political liberal and humanitarian. If you’d read only the chilling “Fly-Paper,” you might think her a master of horror. And from a great many stories one might conclude that Taylor believed marriage was an institution best avoided. Yet marriage, in her accounts, reveals people for who they really are: It is marriage, rather than war, adventure, or striving for success, that is human nature’s proving ground—the arena where the most terrible contests are waged, and the most unendurable pain is suffered.